Derrick Fish has been writing and drawing Dandy and Company since 2001, and he likes to mix it up a bit. I haven’t read all the strips, but from what I have seen of the archives, Dandy is a smart take on the gag-a-day concept. The strips revolve around Bernard, a sweet little boy, and Dandy, his smart, strong-willed, mischievous dog. Yes, it’s a familiar setup, but Fish’s witty dialogue and stable of over-the-top side characters keeps it interesting. Derrick wrote to us a few weeks ago to let us know that he’s turning Dandy into a long-form adventure strip for the summer. He has done this before, and he actually foreshadowed this plot with a short series in May, in which hyper-cute puppy Mistake and robot dog Mr. Fuzzy go missing after a series of ATM break-ins. Dandy goes after them in the new summer story, The Search for Mr. Fuzzy. The story mixes up a lot of old secret-agent and sci-fi cliches with a strong dose of the characters’ individual personalities and a lot of humor. It works pretty well as a caper strip, but the plot is complicated by the fact that Fish is re-introducing characters from older story arcs. He makes it work by putting just enough exposition in the strip to make it comprehensible, then adding additional explanations and links to the earlier storylines in the blog posts beneath the strips. That means longtime readers aren’t bogged down with information they already know, while new readers can pick up bits of backstory as they go. Visually, Dandy is a fairly complicated strip, despite the fact that it sticks to the four-panel structure most of the time. Fish’s style is fairly distorted, which makes the characters more expressive but also harder to grasp at a single glance. He also invests both the characters and the settings with a fair amount of detail. This isn’t a strip that can be skimmed. The strip also tends to have a lot of text, mostly dialogue. I really enjoy Fish’s writing; it’s one of the high points of Dandy as far as I’m concerned. He often breaks the fourth wall, and some of the funniest of his early strips are the ones in which the characters picked a fight with the cartoonist. A word about presentation: The Dandy website is easy on the eyes, but it took me a few minutes to figure out how to navigate it. Fish puts a week’s worth of strips on a single page, which is a fine idea, as it makes the individual story arcs easier to follow. He also presents the archives in story arcs, rather than as individual strips, although he does allow permalinks to each individual comic. It’s different from most webcomics sites, so it took a bit of getting used to, but once I did, I liked it a lot. Dandy is so well done that the adult reader probably won’t notice that it’s really an all ages strip, at least the arcs that I have read. 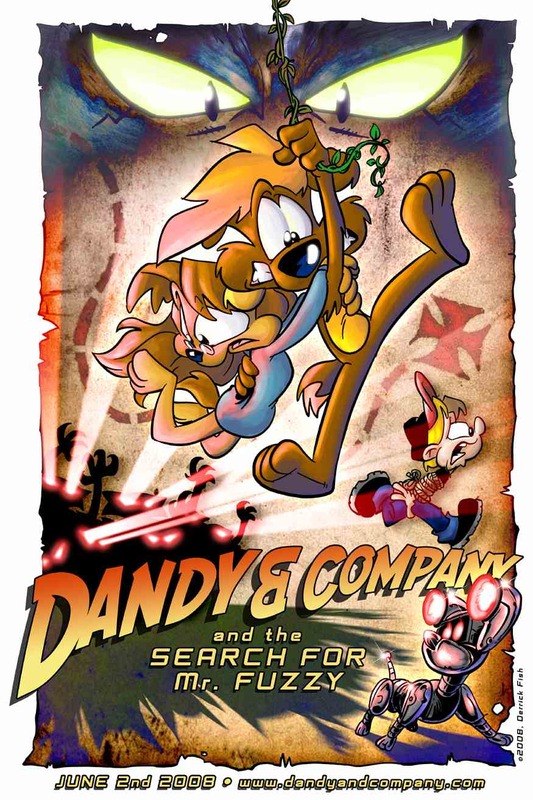 I loved secret-agent capers as a kid, and Dandy seems like a lot of the comics that I used to like. The story is too complicated for younger kids, but I can see a smart 8-year-old being able to follow it and perhaps appreciate some of the meta stuff as well. And for grownups, it’s pure summer pleasure.